This is sort-of the first real Alistair Maclean book I've read. I say "sort-of" because I have read his first book HMS Ulysses and it was really good. However, it is pretty much autobiographical. I grabbed The Way to Dusty Death at the used bookshop/goldmine I discovered in the hospital here. 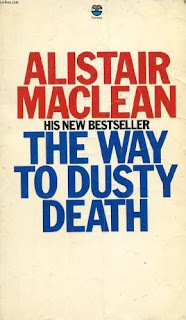 I have avoided Maclean's books simply because they were too popular. This is not just elitist snobbery on my part (though that is a factor), but generally massive mainstream sellers in any genre tend to be the most dumbed down of that genre with bad writing (cough cough Kathy Reichs cough Jeffrey Deaver cough and on and on). What surprised me about this book was how shoddy it all was. I don't know what period of his career it took place or what was going on then, but this book feels like it was cranked out overnight and not edited at all. There is just a lot of really awkward language and scenes where you actually can't quite tell what is going on. The plot is also badly constructed and when the reveal happens, it's super lame and not thoroughly explained. Despite all that, the initial setup is quite gripping and there is some minor masculine heroic behaviour that is satisfying (although the protagonist is a total machine and fundamentally superior to everyone around so that there is little suspense once you figure that out). The story starts out in medias res with the flaming wreckage of an ugly Grand Prix crash. The protagonist is the best driver who was thrown from his car and watches in a daze the burning body of the guy he just knocked off the road. We learn quickly that his brother died a month ago and that he has become reckless and may even be drinking (this is a big deal in Gran Prix driving, I guess). The first chapter portrays him as a total wreck, but there are weird little tells, such as him washing his mouth out with whiskey in his hotel room later then spitting it out. Soon after, he is seen spying on the team owner and the mechanic while they check out his car and you realize that there is a greater game afoot. (This scene is one where I didn't even realize he was supposed to be hiding at first because of the weird way it was written so though the other two characters knew he was in the room.) This part is cool and you definitely want to find out what's going on. If you have read my reviews, you know my taste and that I am very patient with certain kinds of clichés and silliness in men's action fiction. Look, I get chills watching the trailer for The Equalizer 2. I'm an easy mark. I gotta say, I was really not impressed with Maclean with this book. Desmond Bagley crushes him. Yes, he has a similarily macho simplicity, but his characters make sense and they get really challenged, plus he writes well, clearly with punch. Maybe this was on the lower end of Maclean's massive output. They are easy to read, so I will give him another try. 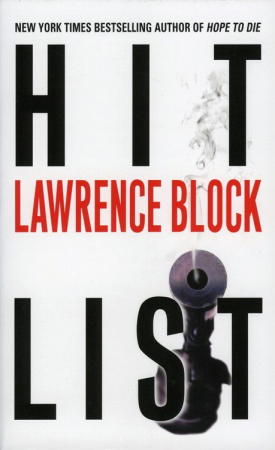 I had actually read Hit List many years (decades, actually) ago as well as its predecessor Hit Man. That was back when we were way into Richard Stark/Donald Westlake and one of my fellow Stark fans discovered the Keller books. Block was a close friend of Westlake. They played in a regular poker group and discussed and shared writing ideas. You can see it in the style of Hit List, though very hard to tell how much of that is just that both of them were deep New Yorkers from that time period. Much of Hit List's style comes from the very New York City quirks of Keller. I'm rambling but my point here is that there may be a tendency to feel that Hit List derives a bit from Westlake's Dortmunder/Parker novels but given that I haven't read anything else by Block, I suspect that is not fair and that Westlake probably was influenced just as much by Block's style. Block may have actually been a better seller than Westlake in his lifetime. Keller is a professional hit man who behaves and thinks about his job the way a garbageman or accountant might think about his. He is concerned about doing his job correctly and some elements of it are unpleasant but there are various ways to deal with them to help you get by. He has a broker/boss named Dot who lives upstate and finds him jobs. Hit List begins like a series of short stories, with each assignment being a story. As it moves forward, we begin to see longer narrative arcs: his relationship with Dot, his relationship with a few civilians and the possibility of another hitman who is eliminating other hit men to limit the competition. There is also underneath it a very slight shadow of Keller struggling with his conscience, especially when Dot pressures him to eliminate any "loose ends" which may include a woman he had been seing. It's all very banal and normalized. Keller collects stamps. He frets about taking first class and enjoys local cuisine. Each assignment has an interesting wrinkle, some of which are quite enjoyable to read in a dark way. I suspect that part of the charm of Hit List is lost today, when assassination and killing have been portrayed in such over-the-top cartoony ways in popular media. When Hit List was published in 2000, we still didn't have headshot ballets like John Wick 2. Despite its impact being somewhat lessened, I would classify the two Keller books as a must-read for anybody interested in the hit man genre and an enjoyable read for fans of crime in general.